Kitchen remodeling cost calculator - labor fees estimator. Labor charges and associated with remodeling fees for kitchen renovation projects. How much did you pay for kitchen remodeling? 1 By default, kitchen remodeling cost calculator estimates minimum, average and maximum labor cost to complete, basic L-shaped 10’ x 12’ kitchen remodeling with standard kitchen cabinets, prefabricated laminate countertop with 4" high backsplash and ceramic tile flooring. Homeowners can easily adjust parameters and calculate total labor charges, per square foot kitchen remodeling cost and approximate time to perform the work based on kitchen dimensions and project details. There is very low probability residential kitchen will exceed 700 square feet and technically it is impossible to fit at least 5 base cabinets, stove and refrigerator in the kitchen which is smaller than 60 Sq. Ft. For that reason calculator estimates labor cost to remodel kitchens which are bigger than 60 ft2 and smaller than 700 ft2. 2 Kitchen dimensions (width and length) in feet should be entered as real numbers means 3 inches = 0.25 feet; 6” = 0.5’; 9” = 0.75’ and so on. 3 Cost of labor to remodel a kitchen divided into three separate categories. Minimum cost is a typical labor fees for very basic low budget kitchen renovation projects acceptable for rentals or low value residential properties. Average cost is a most common charge for majority of mid-range kitchen remodeling projects with minimum customization. Maximum cost is a labor fee for complex custom work. 4 Kitchen remodeling cost per square foot gives an idea what homeowners are looking to invest into every square foot of a future kitchen based on its dimensions and project details. 5 Approximate time to remodel a kitchen is a typical number of days necessary for an experienced crew to complete the project. Calculator estimates labor cost to remodel kitchen only. If contractor will purchase and supply any materials for remodeling project total expenses will increase and all materials expenditures will be added separately. What is basic complete kitchen remodeling? 1. 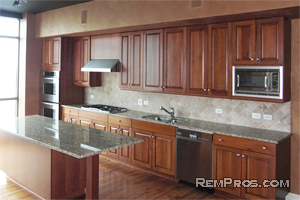 Removal of kitchen appliances, countertop, kitchen cabinets, backsplash, flooring and all light fixtures. 2. Minor insulation and framing work if necessary. 3. Fixing or partial drywall replacement, installation of new kitchen flooring, kitchen cabinets, countertop, backsplash, painting and appliances installation. Basic kitchen renovation means all fixtures will be installed in the same place as they were before. Any changes in kitchen layout will result in extra fees and cost of labor will increase depending on work complexity.